Learn How You Can Benefit From the Powerful Defensive Action of Oregatrex! Why is Oregatrex the best oregano oil available? What are the top 3 questions people ask about Oregatrex? What are customers saying about Oregatrex? Oregatrex is a concentrated, certified organic blend of oregano oil, peppermint oil, cayenne oil, and virgin olive oil! Dr. Group created this extremely potent oregano oil formula to surpass the purity, potency, and effectiveness of anything on the market and have a product he could confidently recommend. Oregano oil is known as nature's potent defender against unwanted invaders. It's potent stuff that nasty critters simply can't handle, oregano oil is toxic to harmful organisms! 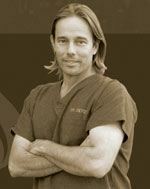 Antioxidants are a defense against free radicals and oxidation -- the process by which your body's cells age and wear out. Oregano oil contains high levels of antioxidants to help fight damaging free radicals. Oregano oil is no guarantee that you'll never get sick, but when you want to avoid what's going around, oregano oil is an extra line of defense against common, seasonal ailments. Oregatrex supports digestion by stimulating the flow of bile to the digestive organs. This can help you get more nutrition out of your food and enjoy more consistent digestion. As an excellent source of vitamins A, C, and E, and zinc, magnesium, iron, calcium, potassium, copper, and niacin, oregano oil helps satisfy your nutritional requirements. What are the Benefits of Oregatrex? Effective at resisting harmful organisms! Promotes joint and muscle flexibility! We are sure you will see and feel the action of Oregatrex. 300% higher concentration of Carvacrol in the oregano oil (minimum of 80%). No artificial, chemical or toxic byproducts. 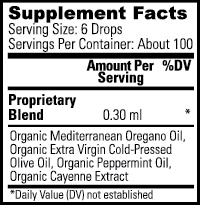 Contains a cold-pressed laboratory grade formula of wild, organic Mediterranean oregano. Contains essential minerals and vitamins. 1. How does oregano oil work? Oil of oregano is naturally toxic to harmful organisms and helps boost the immune system. It's thought to be one of the most effective and safest known agents against harmful organisms. 2. Why does Oregatrex contain cayenne oil? Cayenne pepper is added to the formula to support circulatory health. 3. Can I take Oregatrex without using capsules? No, this blend contains capsaicin and will burn if swallowed. Empty capsules are included and should be used with this product. Oregatrex contains capsaicin (the hot stuff in peppers), add drops of Oregatrex to the included capsules. Prepare capsules as needed, oregano oil will disintegrate vegetable glycerin capsules. Use oregano oil regularly to promote good health. Drink purified water and stay well hydrated when taking oregano oil. Get Started Today and Boost Your Health and Wellness With Oregatrex! If used as directed, Oregatrex should not cause heartburn.